Hey, How About a Blue Hill Stone Barns West? The other is that I’m not the only one who has wondered why there isn’t a Southern California equivalent of Blue Hill at Stone Barns. The chef Harris writes about, Kevin Meehan of Kali restaurant, told her his dream was to create something like what Dan Barber did in upstate New York, a center where food rooted in the region is grown, produced and served. “I decided to get weird. It’s my dream as a chef to have a farm like Blue Hill at Stone Barns, but that’s not going to happen in L.A,” said Meehan. My question is, why not? Why not a farm and food center in Topanga, Malibu or the San Gabriels that showcases native foods and sustainable local farming and animal husbandry? If it can happen 40 minutes from New York City, why not 40 minutes from LA? In the meantime, using front and back yards as sort of micro-Stone Barns is a good idea. Eventually Meehan found a weirdo happy to turn his front yard over to food production, and he uses the bounty of a few local gardeners in his kitchen – as do many chefs in LA, as Harris pointed out. The truth is, weirdos abound. I’m one of them. Ten years ago I ripped out our front lawn in Venice and replaced it with orange and avocado trees and dozens of artichoke plants on a very stingy drip irrigation system. 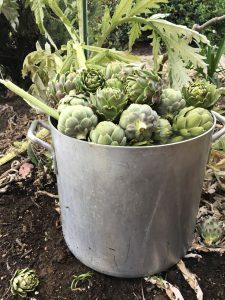 Each year I harvest about 130 pounds of artichokes from a yard that used to grow brown grass. We live in a place of blessing and bounty. One day I hope we’ll realize that. I walked in to Stanleys Wet Goods on Venice Blvd. in Culver City and discovered a dream of a liquor store. Not only do they have a vast curated selection of wines, beer and hard liquor, the staff is made up of enthusiastic and knowledgeable drinkers. And they serve the stuff. With snacks. I asked for a favorite beer and they pointed me to a $10/bottle of Propolis Brewing Spruce Golden Saison, made with spelt and, yes, big piney trees. It’s from Port Townsend, WA, where I’ve been twice. We went there once because it’s beautiful and romantic. We went back because of all that beauty and romance as well as the wild king salmon and ollalieberry ice cream at Elevated Ice Cream Company. This beer tastes like a clear spring morning in Port Townsend smells. It brought me there in a sip. I used a couple of splashes to flavor braised cabbage. The only other ingredients I needed were salt, pepper and oil. If you don’t have Spruce Ale you can substitute another strong-flavored beer. Or you can just make something else. In a large skillet heat whatever fat you want to use. When it’s hot add the cabbage. Cook, stirring, until it begins to shine and soften. On high heat this could take a few minutes. Add the beer and keep stirring. Is it enough? You should see it bubbly away and rapidly evaporating, but not completely disappearing or, on the other hand, drowning the cabbage. Add more if you think it needs it. Add salt and pepper. Cover the skillet, lower the heat, and cook for a few minutes, like 3 or so. When you lift the lid the fragrance should make you blink and sigh. Stir it. Taste it. Adjust the seasoning.